1966 Lunar Orbiter 1: photograph of the Earth, taken from lunar orbit. I was a child when the first photograph of the Earth, as seen from orbit around the Moon, arrived at NASA. Lunar Orbiter 1 was up there, scouting places for a future landing party of American astronauts. As an afterthought, the camera was turned earthwards and this iconic picture was radioed home. It was photographed on this date, August 23, in 1966. Sure, it was a fuzzy Earth. But it set our heads spinning. Soon people would be there. Then cities. I imagined that I might some day take a lunar vacation. Some day. Also in 1966, some of the seminal papers about plate tectonics were published. It was the year when the majority of geologists – for the first time – accepted the idea of mobile continents. Until 1966, the consensus was mixed – drift was not yet considered the best explanation for our planet’s rugged terrain, mountains, ocean basins, volcanoes, and earthquakes. In 1966, plate tectonics took center-place in earth science. 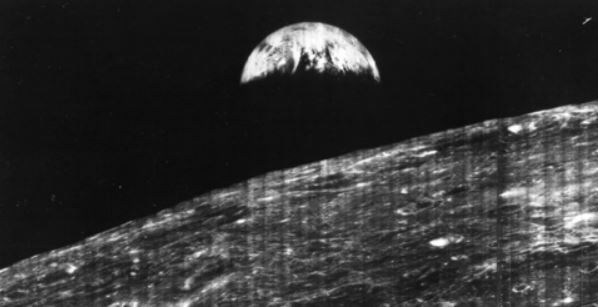 There is a big connection between continental drift theory, the Earth, and the Moon, so it is interesting that the first photograph of planet and satellite posing together arrived in 1966, the same year plate tectonics really took off. The connection is this… For a long time, progressive geologists wanted to accept continental mobility (it explained the odd distribution of fossil homogies and geological structures that leaped across oceans) but geologists couldn’t believe there was any force weaker than God that could move continents. Some geologists, however, pointed upwards. The Moon could move continents. They were wrong, but their reasoning was sensible. Astronomer George Darwin (Charles’s son) noted that if a celestial body had cruised near enough to the Earth when our planet was young, it was possible that a wad of crust the size of the Pacific Ocean could have been wafted into space. This theory – endorsed by many around 1900 – solved both the lunar birth question and the drifting of continents mechanism: continents were seen as sliding to fill the hole left by the departed Pacific Ocean crust. By the 1920s, Reginald Daly, a Canadian who headed Harvard’s geology department at the time, calculated that it was more likely that a wayward planetoid crashed into the Earth. Material was ejected, he figured, and this formed the Moon. A variation of this idea is still considered the best explanation for the Moon’s creation. In Daly’s first model of this scheme, he agreed with Darwin that the ensuing hole formed from the loss of earth material caused the continents to slide and fill in the gap. But in a decade, Daly questioned his own theory and was advocating mantle convection currents as responsible for moving the continents. He was right, however plate tectonics was still a crudely formed notion in 1940. It took another twenty-five years for enough evidence to pile upon the theory to breathe life into it. And so we reach 1966. Space. Images of Earth and Moon as a team. And the whole concept of spreading seafloors, colliding mountains, subducting crust, hot spots and plumes. All of this, just fifty years ago. This entry was posted in History, Non-drift Theories, Plate Tectonics and tagged asteroids, drift, history, Reginald Daly, The Moon. Bookmark the permalink.